Sara (PhD, FHEA) is a senior lecturer in project management in the Department of Business and Enterprise, School of Business. She specialises in Project Management with interests in Risk and the application of decision making tools and techniques in disaster management. Sara has more than a decade’s experience in various positions from supply chain manager of an automotive manufacturer to performance consultant of a worldwide distribution network of medical equipment amongst others, in addition to PhD in the highly analytical field of Decision Sciences in Operations Research, along with educational background in Economics, management and research. She has designed variety of new modules in Project Management and Operations Management in undergraduate and postgraduate level as well as new postgraduate courses in Risk management for both UK and overseas institutions. Her professional experience also fits well within her academic work and the existing team of academics. 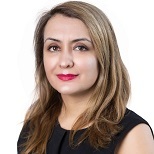 She has extensive international experience in different industries, embarking as a customer account executive of a multi-national transportation company and moving to the supply chain executive of the biggest automotive manufacturer in Middle East as well as executive consultancy in the area of performance and collaborative efficiency to international medical equipment supply networks with offices in UK, Netherlands, UAE and Turkey in addition to pro-bono consultancies to UK-based charities. Sara’s research focuses on various aspects of operations management, systems thinking, disaster management, decision making and serious games. Her most recent piece of research is the development of a predictive framework for disaster response networks as a solution to partner proliferation problems after the disaster strike. She also provide consultancy to not-for-profit organisations on pro-bono basis and acts as anonymous reviewer in different peer reviewed academic journals as well as acting as chairs in various streams in related conferences. She is also a member of the following research groups including “Gender and Disasters” at UCL , “SIG research interest group” at OR society and “Economic and Financial Modelling Research Group” at London South Bank University.